Where do water points fail? 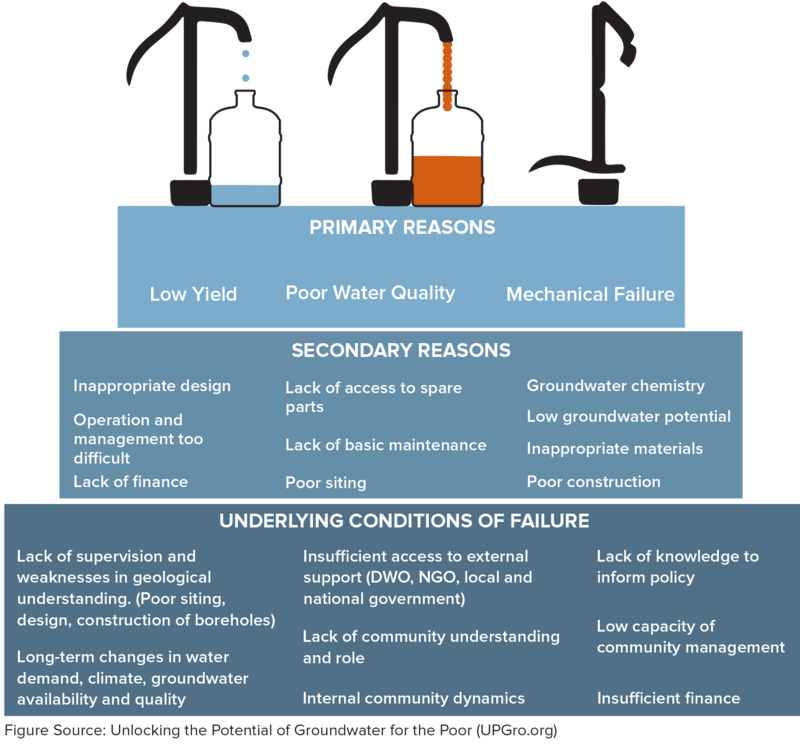 Based on an analysis of traditional ways that rural water and sanitation systems fail in developing countries, Ohio State and partners developed strategies to hit those areas of weakness. Sustainable Village Water Systems delivers life-changing water access through appropriately sized wells to accommodate the populations served in the rural villages we partner with. But water access alone doesn’t respond to the social, economic and physical needs that allow water points to fail and villages to remain in poverty. That’s why Sustainable Village Water Systems include a clean source of renewable energy (usually solar), improved sanitation at clinics and schools, and a direct linkage to economic activities such as agriculture, aquaponics or micro-manufacturing. The Sustainable Village Water Systems Program is operating under a new model: we work at regional scales rather than village by village. With a groundbreaking national agreement with three Tanzanian ministries (anchored by the Ministry of Water and Irrigation), the program is able to capture the benefits of economies of scale and of regional groundwater planning. And our franchising system uses regional and national supply/logistics chains to turn continuous water services into opportunities for new jobs and women-owned businesses. Sustainable Village Water Systems, while tailored to the needs of any given village, are fundamentally composed of a standard set of parts. To design these systems, Ohio State acts as a neutral technology integrator, assembling the best available and most appropriate technologies that fit within regulatory guidelines and for which a supply chain exists or can be efficiently developed. New certificate, degree and vocational programs based at the University of Dodoma and supported by Ohio State will integrate Sustainable Village Water System project sites as hands-on learning and internship opportunities. Students training to serve as technicians or entrepreneurs will be able to learn first-hand how to turn rehabilitated village water systems into economic opportunities. Project sites are also opportunities for gathering data on regional natural resources, climate change, cropping/food production practices and public health. These data will help communities both plan for the food, water and energy tradeoffs that climate change will bring and meet UN Sustainable Development Goals.